This is the first in the AmeRRuss Blade Arts series. It is both a powerful and richly embellished work. It features a 12” six bar composite Damascus steel blade of 15N20 and 1084 steels by Master Bladesmith J.D.Smith. The central core of the blade is “Firestorm” Turkish twists with outer edges of 400 layer straight laminate steel. 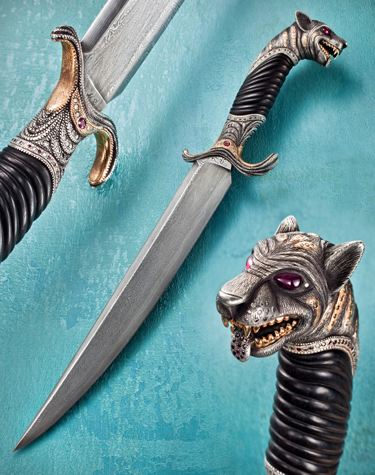 The hilt is fashioned from African Blackwood, gold, silver, rubies and diamonds. Joseph Shnayder has explored his fertile imagination and created a mythical panther in a highly stylized format that evokes tremendous power and mystery. The balance and heft of this highly artistic piece exemplifies the skill of both of these talented artisans. Measurements: Blade: 11.5" Handle: 6" Total Length: 17.5"